Catalog "SA" cannot be resolved for table "Dog"
I copied your properties to my src/META-INF/persistence.xml changing 'sa' to 'SA'. .Still the error is shown. And does this table exist? Thank you, your blog was great help and was able to create a sample application using eclipse link JPA and HSSQL in a short time. If I create a database view on these two tables and map this view to entity class. what are the advantages and disadvantages of this design. I am not sure, I don't want to mislead you - you should give it a try and write some test cases. Call: UPDATE SEQUENCE SET SEQ_COUNT = SEQ_COUNT + ? WHERE SEQ_NAME = ? bind => [2 parameters bound]"
I connect to my db and see that Hibernate did not create the table for my entity! I gues I should do something to "let Hibernate create this table for us".. I'm abit disappointed that this article lacks a general instrustion how to create the table for Entity.. I think that this article may be improved. I will wait for answer.. So if you use the code as described in the article, you don't have to do anything, it already does it for you. As for the other error, I think the user you're connecting with lacks proper privileges. What database are you using? I'm glad to get answer! Thanks! I use hsqldb. I made review of my project and compared with steps in article. I did not create connection to my bd in "Data source explorer". Now I added connection. but after adding connection I see strange error message in my Entity class. 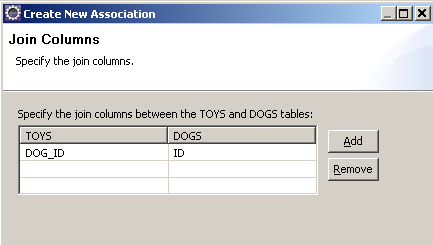 Here is error message: "Catalog "SA" cannot be resolved for table "contacts"". Contacts - is a name of table (@Table(name="contacts") in Entity class). And sa I guess is a default user in hsqldb. But may be it is another "sa".. Still need help. Finally I made it work. There was incorrect platform "Eclipselink" when I created my project first time. There was no Hibernate support in my Eclipse. 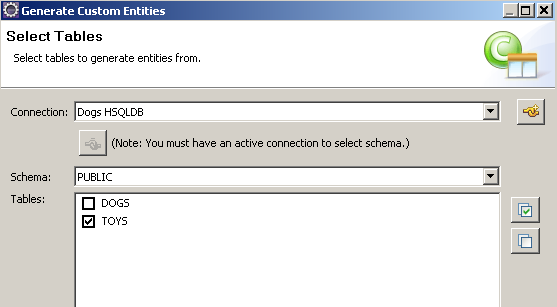 That is why I could not select "Hibernate" in platforms combo-box in jpa project configuration window. I've installed Hibernate plugin to my Eclipse. And created new project. Then I fixed "Catalog "x" cannot be resolved" error. Then I fixed "Table "x" cannot be resolved" error. Then I fixed some other problems. And finally my project start to work!!! So much problems with this example... Some of this problems were caused by inattention. Some of them appeared becouse of... I don't know why. May be becouse of karma? :) I think there are another programmers with such karma as my. And this article does not contain every possible error description.. But may it should not? Hi, I'm glad you got it working. I guess exceptions and research are part of learning process. The goal of this blog post is to get you started and provide a basic to-do, rather than explain every single thing that might go wrong. Thanks to your comments and experience the article is now more complete, thanks. 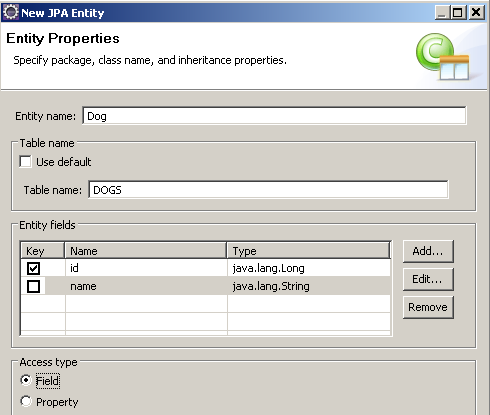 While following it with my own code, I just found a way to get JPA to generate the relations between tables. All you have to have, is the tables already created in the DB. 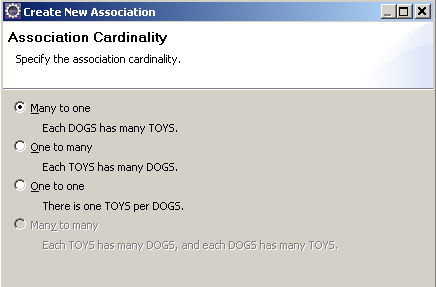 Then right-click the entities package and select "New -> Entities From Tables". 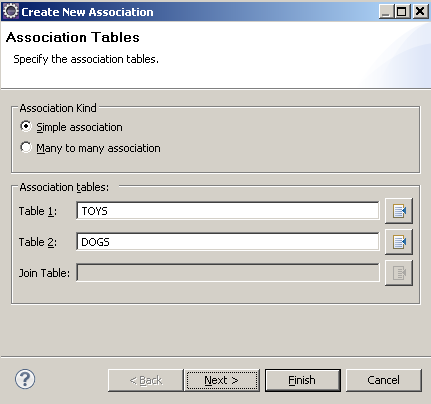 On the following screen select all the tables that have relationships among them and click next. Voila! On the "Table Associations" screen you'll find that the relations now appear mapped, and if you generate the code, all the annotations needed will be there, automatically generated. Thanks for your input, José! How can I choose to create memory table or cache table? Can it be done in annotation or through configuration? See part 1 of this tutorial, please. 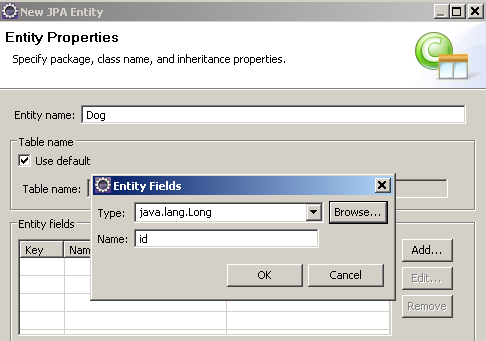 JPA for eclipse only seems to support up to hsqldb 1.8. When are we going to see support for the newer versions of HSQLDB? 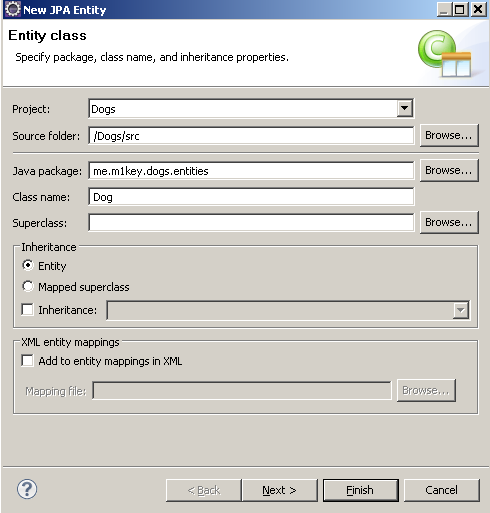 Nice tutorial, although using Hibernate 4.3.7 I had to add hibernate-entitymanager-4.3.7.Final.jar as well. I noticed that I get a warning when running the code, saying "Encountered a deprecated javax.persistence.spi.PersistenceProvider [org.hibernate.ejb.HibernatePersistence]; use [org.hibernate.jpa.HibernatePersistenceProvider] instead.". I checked your code and there seem to be some differences between the necessary jars, you don't have an "hibernate-entitymanager" jar in your project. What am I missing? I'm completely New to hibernate. Tried to do this example with hibernate 5. ... and i failed completely. Don't even have a clue what went wrong.